The day is coming where pretty much everything we want will be forbidden or rationed might as well stock up now. 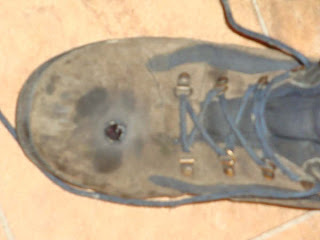 Received via email (no other details, it appears he really got lucky) Per The Armed School Teacher this may have been from a 12 GA,(see comments) I added the shoe photo, that came with the other, it does not appear to be big enough for a 12 ga resting on the foot, (but entry holes can be deceiving) if it was indeed a 12 ga, this idiot was really lucky. From the above book, close contact shots usually are a bit more devastating. Yes, cell phones and texting are still allowed. If the C&C fears the weapons of his own military, then he must go into PSH over mere citizens having any. It is going to be a wild & crazy ride my friends. How do stand against tanks? 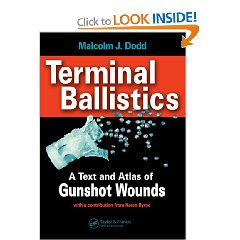 Well it's no wonder there is no ammo, that it is being bought as fast as it hits store shelves, they want to to an end around on the 2nd amendment. About 12 dumptruck loads so far, suppose to be 10 more today, & hopefully the "new" range will be done, we will go from around 24 feet to around 50 feet of back stop, with wings, although we won't be able to shoot south, we will be able to shoot north as well as east, & it will be a bout 2 foot taller. While he is here I'm having in put a compacted dirt pad in so we can add a yard barn for target storage etc right behind the pistol line.